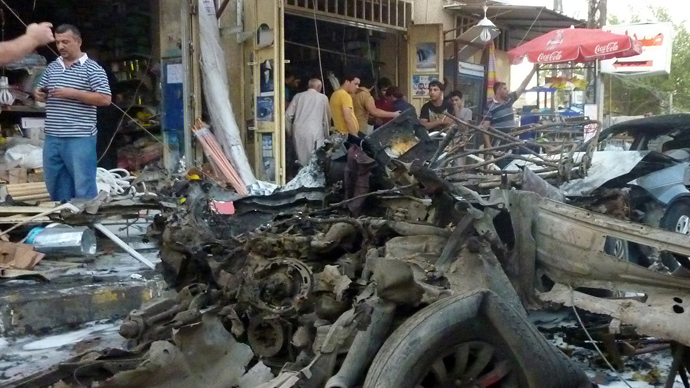 A string of bombings has killed at least 96 people in the Baghdad suburb of Sadr City, Ur district and the northern city of Baiji, adding to the worst year of violence since US troops began leaving the country in 2008. 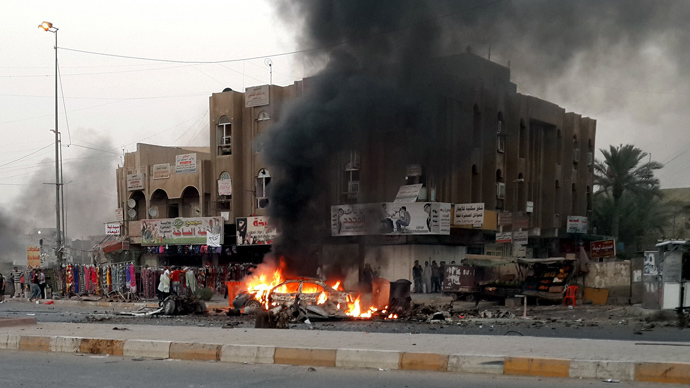 The first bomb exploded next to a tent full of mourners in the Shiite neighborhood. 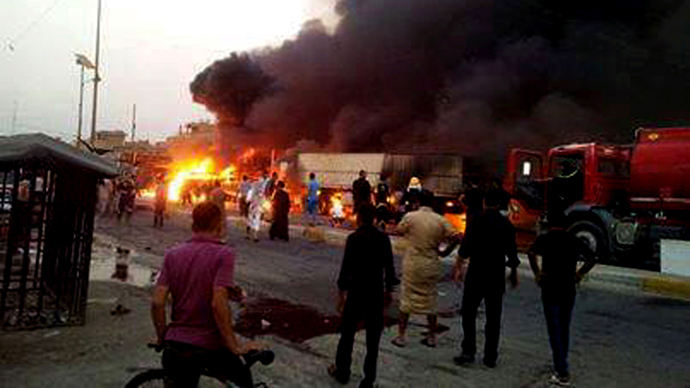 Shortly after, a suicide bomber detonated his device while driving a car near the funeral-goers. A third bomb exploded as police and ambulances arrived at the scene. "Crowds of people were visiting the tent to offer their condolences when suddenly a powerful blast...threw me to ground," said 35-year-old Basim Raheem. 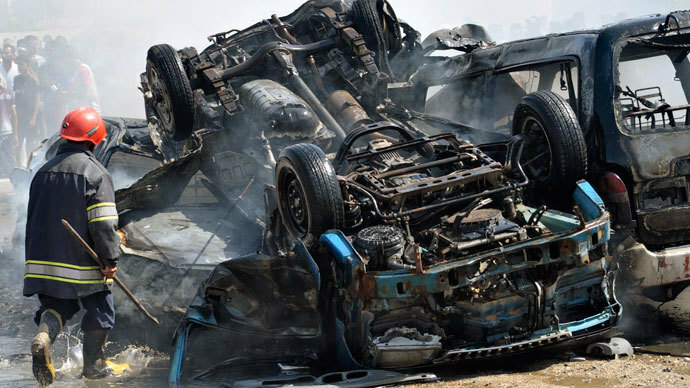 "When I tried to get up, a second blast happened. My clothes were covered with blood and human flesh. I thought I was wounded, but later discovered I was lying in a pool of others' blood," he added. No one immediately claimed responsibility for the attacks in Baghdad, in which at least 72 people were killed and 120 others wounded, medics said. However, the majority of the region’s attacks are carried out by Sunni insurgents with links to Al-Qaeda, who say the Shiite government is discriminating against the country’s Sunni minority. 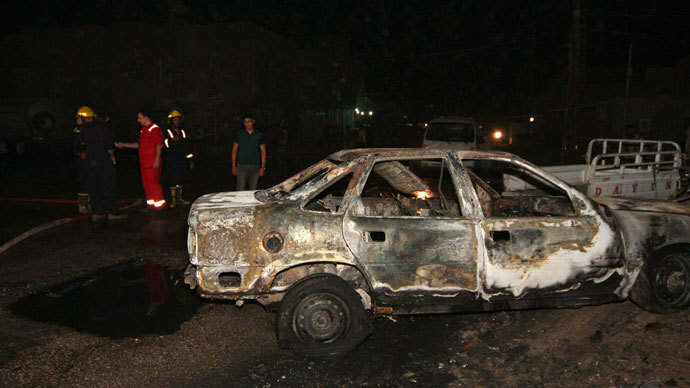 In a separate incident, at least nine people were killed and 14 others wounded when a car bomb exploded in the predominantly Shiite Ur district of the capital, police said. Later, militants later attacked a shop that was discretely selling liquor in a Sunni populated area of Baghdad’s Azamiyah district, killing four, police reported. Gunmen also stormed two houses in the city of Mosul, located 360 kilometers northwest of Baghdad, killing two soldiers. Another attack in the area struck a military convoy, killing two soldiers and wounding four others. Earlier, four suicide bombers attacked a police special forces base, killing seven and injuring more than 20 security officials in the northern city of Baiji. Police shot one of the militants, although the others managed to enter the base and blow themselves up. Some experts are pointing to the beginning of the US-led invasion of Iraq under the George W. Bush administration as the main cause for the current violence. Becker also made a connection between the perpetrators of the Iraqi attack and the opposition that is trying to topple the Syrian government. Iraq has been hit by a deadly wave of bombings over the past year, as the civil war in neighboring Syria aggravates sectarian divisions in the bitterly divided country. At least 800 Iraqis were killed in August according to the UN, with more than one-third of the country's attacks taking place in Baghdad. The bloodshed, 18 months after the last US troops pulled out, has led to concerns that Iraq is slipping into a civil war. At the height of the sectarian slaughter in 2006-7, the monthly death toll was sometimes as high as 3,000 people.